I don’t often get the time at the Farmers Market to talk with customers in depth about the benefits of heirloom varieties and organics. So I thought it would be helpful to commit those thoughts to my blog. So what makes heirlooms and organics so great anyway? First, and this may surprise you, many heirlooms ARE hybrids, in the sense that they were often the attempt to capture the positive attributes of two or more varieties, but unlike today’s hybrids, they have been grown out for so many successive generations that the genetics became standardized and the new variety was “open pollinated,” i.e., you can save the seed and that seed will grow true to the parent. These are the varieties venerated and saved by our grandparents and great grandparents, often brought with them when they emigrated from Europe, Asia, Africa and South America, and grown as family heirlooms. But in modern times, seed companies have developed new strains specifically for commercial growers that often sacrifice the very qualities we seek as home growers for those qualities valued by the commercial growers and their end customers – the grocery stores. That is: higher yields, ease of transport and longer shelf life. A tomato that can be harvested green, gassed to color and brought to the store red and without bruising is, in their business plan, more desirable than a red, luscious, extremely flavorful heirloom tomato that could never make the transit from farm to grocery to table when hundreds or thousands of miles are involved. Unfortunately, these same hybrid seeds are also marketed to home gardeners, who like the ease of growing such hybrids (high disease resistance and germination) and are unaware of the sacrifice of flavor and other qualities they are making with such choices. 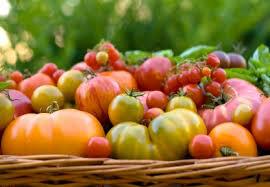 Now, what is the advantage of growing heirlooms in an organic fashion? EVERYTHING! First, there is the health advantage. Good organic gardens are built on compost rich organic soil populated by earthworms and a healthy beneficial microbiome. It may take years to create that if you are starting with poor or compromised soil, but it is worth it. Non-organic soils depend on chemical fertilizers, which take a heavy toll on the environment, and also deplete the nutrients in your produce. Study after study has shown that produce grown organically has a far richer nutrient composition than its non-organic competitors. Add to that the advantage of the freshness of home-grown, or locally-produced, which reaches your table faster with less loss ofnutrients, and there is no question that organically produced home grown or locally grown produce is far superior in every aspect. An additional, and perhaps more important, advantage of organic produce is the lack of pesticides. Pesticides are toxins. Whether sprayed on your lawn or your broccoli, or imported via the produce seedlings you buy at your local nursery, they can wreak havoc with your and your family’s health. Just to give one example, if you use pesticides when pregnant or nursing, your children will have a 3x to 9x increase in the possibility of leukemia. There are countless other health implications. Finally, organic gardening supports the environment. Everything from the richness and health of the soil, to the health of pollinators, including honey bees, to birds and animals. Chemical fertilizers not only pollute the water, they do nothing to enrich the soil — the very heart of our agricultural system. Worse case, pesticides such as neonicotinoids — widely used by US-based growers and nurseries — not only pollute the plant they “treat,” but migrate into the soil of your garden and toxify all your plants for pollinators such as honey bees. That is why they are banned in Europe! So, to sum up, organic heirloom plants and produce are LESS EXPENSIVE, MORE SUSTAINABLE, AND HEALTHIER! What’s not to love? I grow and eat organic, and I sleep better as a result! This entry was posted in Garden, Health and tagged Organic by Cherry Gal. Bookmark the permalink.